SSD prices may drop following impending price war | MacFixIt – CNET Reviews – Carpet Bomberz Inc.
via SSD prices may drop following impending price war | MacFixIt – CNET Reviews. Great analysis and news from Topher Kessler at C|Net regarding competition in the flash memory industry. I have to say keep your eyes peeled between now and September and track those prices closely through both Amazon and Newegg. They are neck and neck when it comes to prices on any of big name brand SSDs. Samsung and Intel would be at the top of my list going into the Fall, but don’t be too quick to purchase your gear. Just wait for it as Intel goes up against OCZ and Crucial and Kingston. The amount of change in prices will likely vary based on total capacity of each drive (that’s a fixed cost due to the chip count in the device). 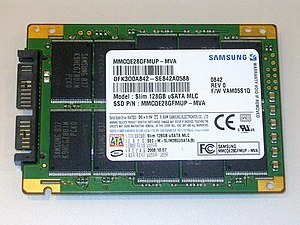 So don’t expect a 512GB SSD to be dropping by 50% by the end of Summer. It’s not going to be that drastic. But the price premium brought about by the semi-false scarcity of the SSDs is what is really going to be disappearing once the smaller vendors are eliminated from the market. I will be curious to see how Samsung fares in this battle between the other manufacturers as they were not specifically listed as a participant in the price war. However being a chip manufacturer gives them a genuine advantage as they supply many of the people who design and manufacture SSDs with Flash memory chips.